With British Pie Week just a few weeks away and Pierate - Pie Reviews becoming the leading promoter of the pie in British Pie Week, we thought that the week long celebration of pie needed a new logo! With the pastry company behind British Pie Week seemingly not promoting the week long event any more, there is no designated British Pie Week logo for 2019, so we at Pierate Pie Reviews have stepped in and can officially announce the new logo to the world! Featuring a pie design, knife, fork and the date, we've kept the logo simple but effective and we are happy for any websites, companies or other sources to use the logo for free. Unlike the previous commercial logo, we're not looking to promote our brand or product, but simply want a logo that focuses on the pie and puts the pie back into the centre of British Pie Week! For those that don't know, we at Pierate Pie Reviews are a few friends who love pies and want to see them recognised for what they are - the piefect heart warming meal or snack in a pastry parcel! It just so happens that we've rated well over 625 pies in the process! 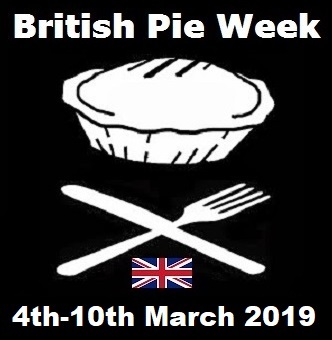 And we once again plan to be at the heart of British Pie Week 2019 - which is this year from Monday 4th to Sunday 10th March - and you can follow our adventures on Twitter and this blog throughout the week, as we once again do our daily Pie Week Diary. 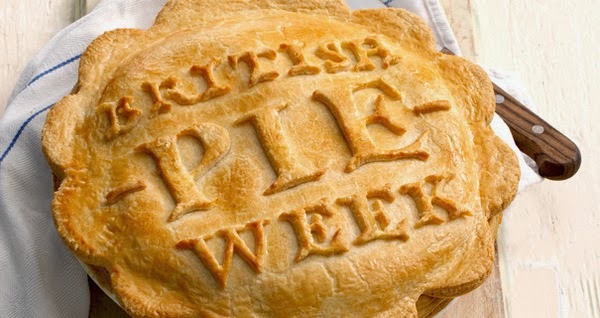 British Pie Week 2019 is from 4th to 10th March! Whatever you’re going to be up to this British Pie Week - and it's never too early to start planning - we hope you have pie and enjoy it! For more ideas, why not check out our #PiePledge video below?